In what could be a significant boost to environment protection, China is considering introducing environmental taxes in the country. This was revealed in a report by Xu Shaoshi, head of China’s National Development and Reform Commission. Xu delivered the report on behalf of the State Council to lawmakers attending the bi-monthly session of the Standing Committee of the National People’s Congress (NPC), China’s top legislature, that opened in Beijing on Tuesday. 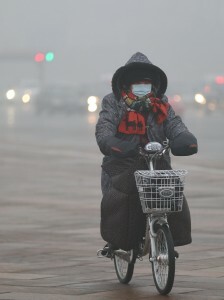 Pollution has been an issue of increasing public concern in Chinese cities. In Beijing, the concentration of airborne particles, called PM 2.5, in January this year averaged nine times the safe level defined by the World Health Organisation. In addition to compensation drawn from central and local fiscal funds, China will also turn to more market-oriented systems, such as carbon trading, emissions trading and eco-labels, to encourage environmental protection, Xu said. The eco-compensation mechanism refers to a system in which governments and beneficiaries pay for the protectors’ costs and the potential losses they incur by refraining from developing. The new report also cautions that as China steps up its industrialisation and urbanisation drive, environmental pollution and ecological degradation may worsen. According to a report from the NPC’s Environment and Resources Protection Committee, have noted the “poverty of a good environment” in some Chinese towns and cities. Over the last 12 years, the annual investment of the central government in eco-compensation has grown from 2.3 billion yuan ($368 million) in 2001 to 78 billion yuan last year, with the total sum reaching 250 billion yuan, according to Xu. China has set up a special fund for ecological management and restoration in the mine zones, the report said. The government is also giving financial aid to the efforts of wetland preservation, marine ecosystem restoration and protection of the country’s key eco-functional regions, it added. According to new research released by The Pew Charitable Trusts last Wednesday, among the Group of 20 nations, China reclaimed the top spot in clean energy investment, attracting $65.1 billion, a 20 per cent increase over 2011 and 30 per cent of the total for the G20 group.